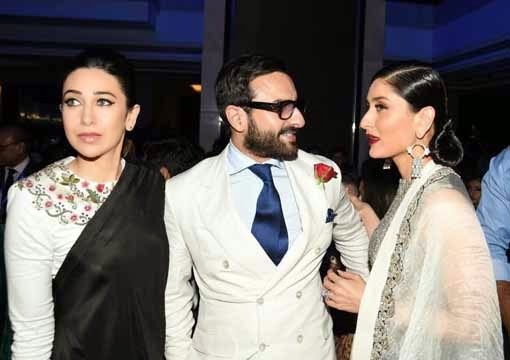 Mumbai : Bollywood actor Saif Ali Khan's wife and also actress Kareena Kapoor broke her silence and opened the mouth on the Padma award controversy, she says that, husband Saif Ali Khan would be okay giving back the 'Padma Shri award' bestowed upon him. It was a Saifeena moment crowned the Anamika Khanna finale at the Lakme Fashion Week Summer Resort 2015 on Sunday night in Mumbai. An RTI application had revealed in August last year that the government was examining a demand for taking back the Padma Shri conferred on Mr Khan in the wake of a Mumbai court framing charges against him. It is alleged that Mr Khan had punched on the nose of a South Africa-based businessman and his father-in-law at a Colaba hotel in February 2012. Speaking out on the issue for the first time, actress Kareena Kapoor has said that the honour had been bestowed upon her husband and that he had not really asked for it. "The fact is that it is a national honour and they have obviously researched pretty well to have given him this award," she said. Commenting on the scuffle that happened at the Wasabi restaurant of Taj Hotel in Colaba, she said, "If they want to discuss it, what had happened at Wasabi and how it should affect the Padma Shri, as far as I know, I haven't discussed it with him yet but I am quite sure he is pretty relaxed and okay to give it back." Kareena gave the interview to a TV channel on the sidelines of the Lakme India Fashion Week in Mumbai. Mr Khan and his two friends had pleaded "not guilty" in the incident after a metropolitan court in Mumbai read out the charges to them in March last year. Demanding that the actor be stripped of the award conferred in 2010, an RTI activist had filed a complaint with the Union Home Ministry on March 14, 2014. In response to a subsequent RTI application filed to know the status of his complaint, the Home Ministry had replied that "the matter was under examination".